Spring in Japan is an important moment. It ‘s the time when nature wakes up and the flowers bloom, and in particular the beautiful Japanese cherry blossoms, the “sakura,” which for centuries has been a symbol of the boom of the samurai and for which even today in the country of Rising Sun is used to organize events budo open to the public. Following this tradition was born, thanks to the work Aikibudo Yamato for popularization of martial tradition and culture of traditional Japan, the eleventh edition of the “BudoSpring”. 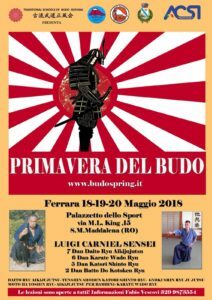 The event, organized by Aikibudo Yamato and International Koryu Budo Seifukai Orgnanization includes three days of practice of various forms of budo high-level excellent teachers from Italy and abroad that will make this “martial festival” an unrepeatable event internationally. A must-see event for lovers to practice budo and a great opportunity to learn about this fascinating world to those who, while curious, have never before had the opportunity to see him.